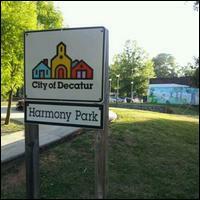 Harmony Park is located in Decatur's Oakhurst community. Parking: Street parking is available. MARTA: Take the Green/Blue Line to the East Lake station: Exit on the south (College Avenue) side of the station and walk south on East Lake Drive into Oakhurst.